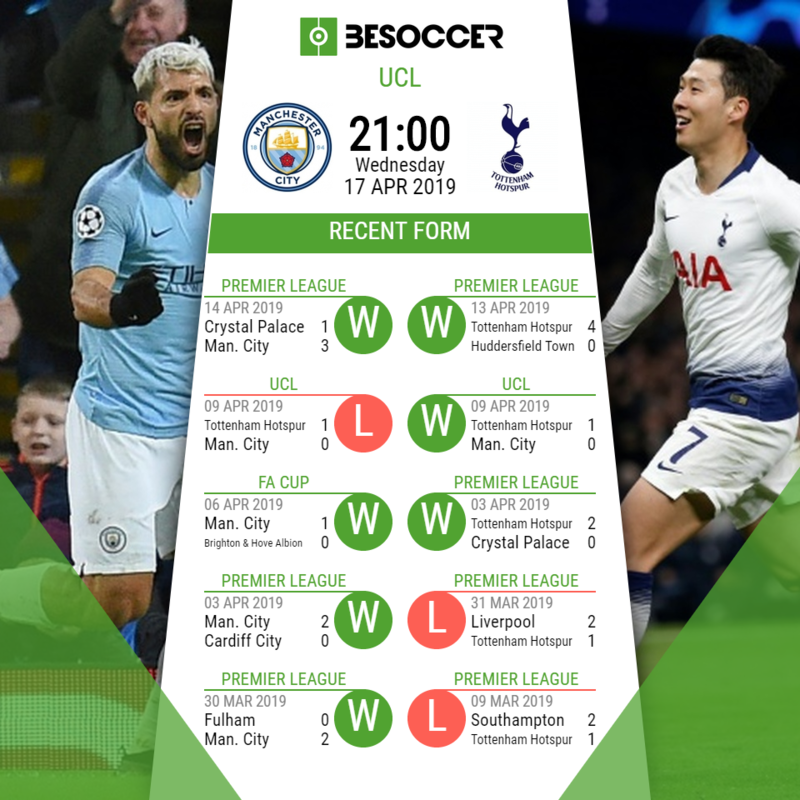 We look ahead to the Champions League Quarter-Final second leg between Manchester City and Tottenham Hotspur at the Etihad Stadium. It seems certain that Kevin De Bruyne will be recalled to the starting XI, but Leroy Sane has often been used as a bit part player by Pep Guardiola in the biggest ties of this season. Fernandinho was absent in the Crystal Palace victory at the weekend, but is likely to return to the starting lineup against Spurs. Bernardo Silva also came back with a 25 minute cameo against Palace. Sergio Aguero is likely to be the preferred striker, with Olexsandr Zinchenko possibly looking to replace Fabian Delph on the left side of defence, with Benjamin Mendy not yet fully fit for the hosts. The main injury concern for Mauricio Pochettino is that of Harry Kane, with the English forward likely to miss the rest of the season. Dele Alli is also unlikely to play due to a broken hand that was sustained in the victory over City. Fernando Llorente is also a doubt after a knock against Huddersfield and will require a late fitness test, as will Alli. Son Heung-Min is expected to start at striker, with Lucas Moura possibly forcing Pochettino's hand after the hat-trick at the weekend. Eric Dier, Erik Lamela and Serge Aurier are all definitely missing for the away side. "Sergio is fit. He needs competition, and needs a little time to get to his best condition. Tomorrow is not about physical condition. We want to get to semi-final, that is the challenge." "If we don't win these games this week, we lose both titles. This season we had an incredible opponent in Liverpool. Usually 84, 85 points is enough to win the title. We both deserve it but only one can get it." "We know that they're so strong and have a very high tempo from the beginning, but that is our challenge - to try to stop them, to be offensive and attack. We need to believe that we can stop them and show our quality." "For us to beat them in the first leg was an amazing result, but we know very well that the tie is still open. But what we have is the belief and the faith that we can be strong. We are going to fight." Manchester City: Ederson; Walker, Otamendi, Laporte, Zinchenko; De Bruyne, Fernandinho, D.Silva; Bernardo, Aguero, Sterling. Tottenham Hotspur: Lloris; Alderweireld, Sanchez, Vertonghen; Trippier, Sissoko, Winks, Rose; Eriksen, Lucas; Son.